Finally getting around to posting the projects from my November stamp clubs. Been a bit crazy since I started working a job outside of my stamping. This project was one that was demonstrated during this past year's convention. And, it was a real hit with all the gals. 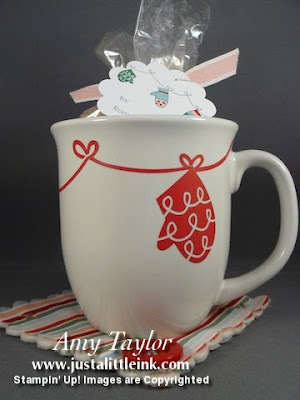 The mugs can purchased at any dollar-type store, and the mittens (or other images as there are 10 different ones) are Decor Elements available in the Holiday Mini catalog, Candy Cane Christmas Decor Elements, $14.95. The fabric and buttons are also available in the mini catalog. 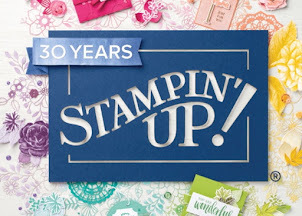 The mug-mat was cut using the Scallop Square die and the Sizzix Big-Shot. The fabric is on sale at 50% off through the 30th of November! The final project we made was this cute card, using the stamps from A Cute Christmas (another mini catalog item) and Come to Bethlehem (just the "Merry Christmas" image). The background paper is the Candy Cane Christmas Specialty designer series paper. Ovals were cut using the Ovals die and the Sizzix Big-Shot. Following you now from SC, #117. Adorable projects! Following along from SC! these are adorable, very sweet card and mug...have a fabulous week!